Free Shipping Included! Weloop Hey 3S Smart watch, Multifunction Outdoor IP68 Waterproof Sport Bluetooth GPS Fitness Activity Tracker Smartwatch with Heart Rate Sleep Monitor message remind for iPhone android (Black) by Weloop at All Company Mobiles. MPN: Weloop-Hey3s. Hurry! Limited time offer. Offer valid only while supplies last. 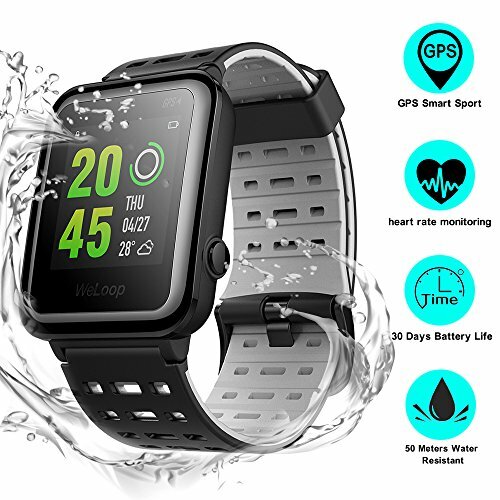 Weloop Multi-function GPS Fitness Activity Tracker Smart Sports Watch Features Weloop is a new brand and professional Supplier for Sport Smartwatch. Weloop is a new brand and professional Supplier for Sport Smartwatch. Hey 3S is our first global market product and we have around 200 engineer working on it. It is using sensitive touch capacitive LCD Screen, ultra slim and lightweight. Download the APP from the iPhone and Andriod APP Store, using the bluetooth connect with your phone, then you can perfect track your body and your sport activities. Track running distance, time, pace, heart rate, calories, speed, cadence, pace, altitude, and elevation gain/loss. GPS: track your route and distance with built-in GPS. open the outdoor running image on watch and connect the GPS. After you finished running, refresh your activities in our App and click the running record, you can view your route and share it on App. Galaxy Note 8, S8/ S8 Plus, S7/S7 edge, LG V30, V20, G6, Sony XZ1, XZ Premium, Huawei, HTC and most of the Android and IOS Smartphone. Feel free to contact with us if you have any questions on our product and sevice. 【 SMART HEART RATE MONITORIN】Automatically adjust the optical algorithm based on the motion mode to track the heart rate in real time and further improve the accuracy. Allows you to keep track of your status during exercise and develop a reasonable fitness program. Heart Rate reachs: Highest: 186/min Average: 169/min. 【50 METERS WATER RESISTANT】IP68 Waterproof Design up to 50 meters underwater. The highest Waterproof Level Smart Watch in Smart Wearables Industry. Professional swimming stroke recognition, including four kinds of swimming positions: freestyle, butterfly, breaststroke and backstroke. Doing the SWOLF analysis by the accurate calculation of the number of stroke and single trip time. 【LONG BATTERY LIFE UP TO 30 DAYS】Built with 270mAh battery with Long working hour up to 30 days with full Charge, no need to worried didn't take the charger while traveling outside. Use GPS+AGPS multi-sport tracking technology to track runs, cardio, Swimming, cross-training, biking and more. Effortlessly and automatically record other workouts to your Phone. 【MULTIFUNCTION DAILY APPLIES】Track steps, distance, calories burned, floors climbed and active minutes. Stay connected with call, text & calendar alerts and notifications from your favorite apps like Gmail, Facebook and more (when phone is nearby). Latest design, 1.28 inch Sensitive touch Capacitive LCD screen, Ultra Lightweight only 38g and you will feel comfortable while you wear it. The sport smartwatch will never let you down! If you have any questions about this product by Weloop, contact us by completing and submitting the form below. If you are looking for a specif part number, please include it with your message. Ticwatch 2 Classic 42mm Stainless Steel Smartwatch - Onyx - Mobvoi Voice Contral Ticwear OS Compatible with Android and iOS,Personal Assistant on your wrist.